This is going to be an extremely interesting deal for the big kids, and indeed the actual kids, amongst us! 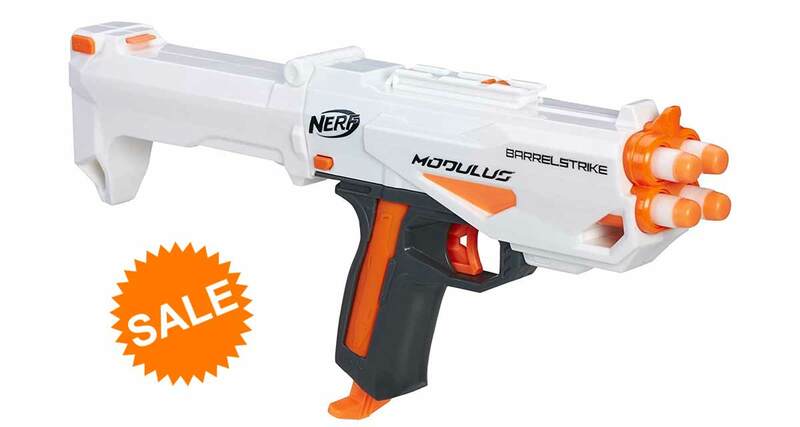 The extremely portable, addictive, and entertaining Nerf Modulus BarrelStrike gun is now available with an impressive 43% discount. This lightweight and portable Nerf gun is definitely one of those gifts that is going to act as a low-price stocking filler and will give countless hours of delight to those kids who receive it. This option sits at the lower end of the Nerf range in the fact that it houses four individual darts. All of which can be fired one-by-one, meaning that you have four individual attempts to assassinate your target. You could pop up around the Christmas dinner table; you could shoot at people coming through the front door. With this cheap gun, you get four attempts before you need to retreat and reload. The gun itself ships with the blaster hardware, four individual darts, and instructions on how to use it. Not that you should actually need them. It also offers the possibility of clipping and additional blaster attachment onto the main part of the gun, hence the “modulus” part of the naming convention. 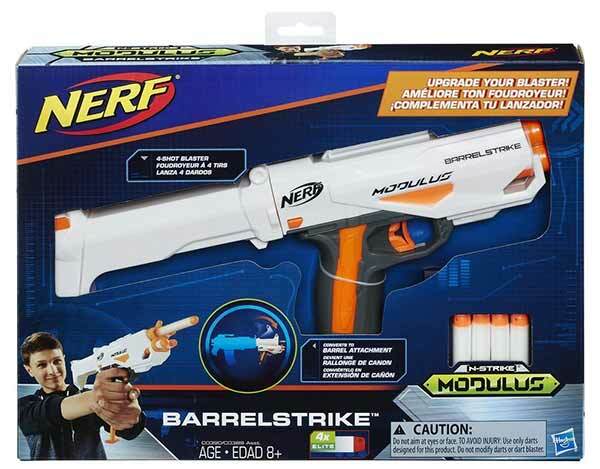 If you take your Nerf activity seriously, then this is definitely the gun for you or your kids as it provides a solid base for the amateur shooter but is also extendable for those who want a little more power and action. This is definitely a great deal for anyone looking to put something affordable under the tree this Christmas. Or, it could make an excellent stocking filler for anyone who has a lot of people they need to purchase for and who usually go for something on the cheaper side to minimize the cost of the festive season. This is actually the lowest price that we have ever seen this particular product sold for, which is another reason why it is worth snapping them up right now. Plus, if you have some birthdays for children coming up, it’s worth grabbing a few of them to maximize the savings. Don’t say we don’t bring you an array of varied savings!